Now that I’ve finished blogging about my trip to Malaysia, it’s back to normal programming for my blog! I still have so many old outfit shots I haven’t blogged about like this one. 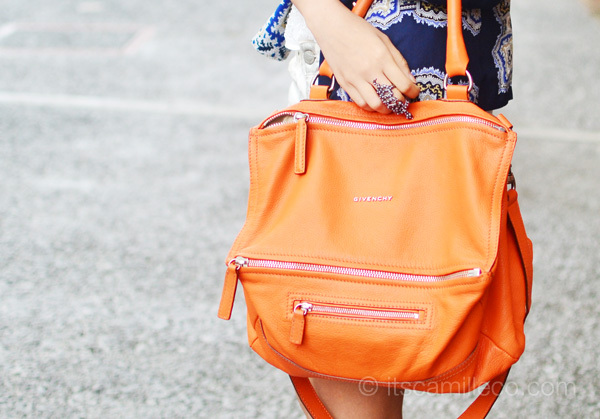 This is what I wore to the not-so-recently concluded Bloggers United 3. I knew I was in for a long and tiring (but fun) day so definitely no sky-high heels. I opted for a simple outfit that I can easily move around in. Of course when I say simple, I mean the basics but with a little something extra. It’s your basic cami top, shorts and blazer except my cami top is embellished, my denim shorts are metallic and my blazer has the best print everrrrrrrrrr! Hi Cam! I really love your style! And I really love what you did here. I have the same pair of shorts in gold. Any tips on how to style it? Diba may ka-partner na shorts yang blazer mo? Did you get that one too? I wish I can see you wear them soon! I’m just curious, why don’t you always blog about your outfit? Kasi sometimes I see you attend events with other bloggers who, most of the time, post their outfits for that occassion, but you? Not so often. Thanks Hannah! I agree! They fit so well too!
. wow ! I love your outfit . Hello Ate camille! Meeting you at the BU3 was fulfilling. I wasn’t able to go to the Candy Style Awards that’s why I really pushed through going to the bazaar even if I was all alone. Anyway, I’m a big fan of yours both as a fashion designer, a model, a stylist and a blogger. Keep on blogging good stuff and I hope to see you again at the the next Blogger’s United. I know! I’m so late! Haha! 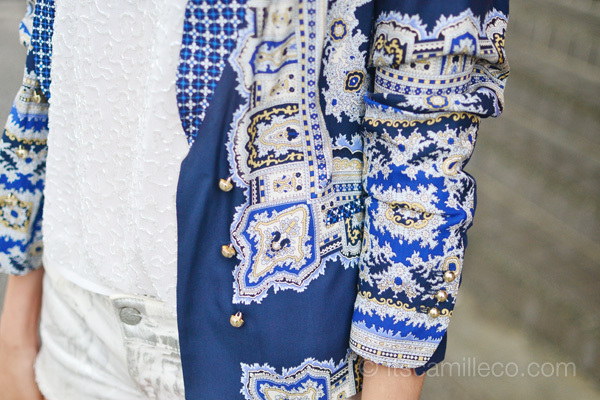 Love the print of your blazer! I am one youre fan.You inspire me everyday with your blogs. Naging inggitera ako simula ng nakita ko blogs mo. How i wish na nagagawa o meron din ako ng kung anong ka. How i wish na alam mo kung gaano ko nagprepray na makilala ka one day. :D Everything will end up just a dream. I am a mother at the age of 17. Kaya Hanggang pangarap na lang ako sa mga ganitong bagay. So dito na lang. GOOD LUCK SA LAHAT LAHAT. GOD BLESS ALWAYS. Thanks Eunice! Mother or not, you can still achieve your dreams! Nothing is impossible! Thanks Regine! I remember! Was it pink ba? Thank you Isa! It’s so hard to choose! Don’t make me choose haha! oh changed settings? why do I have to fill up again and again before I can leave a comment? Thank you :) Hindi naman! Hahaha… I think we have the same excuses! Lol. Zara makes the nice blazers! Your legs go on forever… O____O Wearing those shorts make you seem taller than you already are. And I’ve seen how tall you are. Agree with you on your blazer. Love the batik print on it. I’m quite distracted with your chosen location. Can’t help but think I know that building. It’s probably somewhere San Antonio Village in Makati, isn’t it? I have the gold ones too! Thanks Jeline! Love this. so clean and simple! :D Ganda lang ang puhunan! Don’t you get conscious when you wear really short shorts? Not that I’m saying you don’t have what it takes, (HELLO? If you got it, flaunt it nga sabi ni Beyonce!) it’s just that If I were on your shoes I don’t like being looked at in the most mahalay way haha! Pero kung gwapo naman yung titingin, GO LANG! May bonus pa siyang touch. CHOSSSS! lol! Of course I don’t wear them to strange places. :) And I do choose my shorts, trust me. There are so many cute shorts out there I couldn’t buy because they’re too short :( Haha I really love your comments! Always so funny! :) Thanks Tasha!